In 2001 the Louis I. Kahn Visiting Assistant Professorship at the Yale School of Architecture was established as "an opportunity to infuse Yale with new ideas and new voices," according to Dean Robert A.M. Stern. 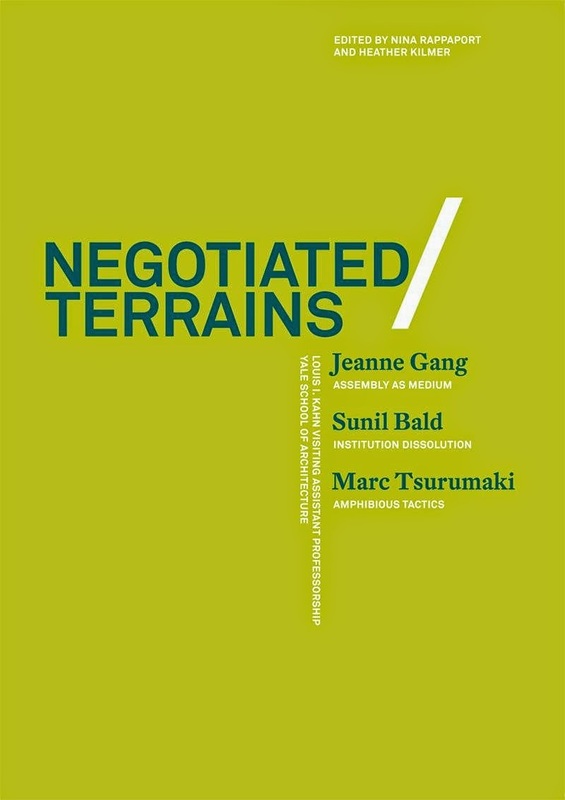 The professorship, which is earmarked for young architects and can be seen as an antidote to Stern's reactionary views, has been documented so far in two books, 2007's Layered Urbanisms and this year's Negotiated Terrains. The first documents the studios of Gregg Pasquarelli (SHoP), Galia Solomonoff (SAS), and Mario Gooden (Huff + Gooden), and the second presents the studios directed by Jeanne Gang (Studio Gang), Sumil Bald (studio SUMO), and Mark Tsurumaki (LTL). Documentation includes an interview with the architects, their studio description, the project's program, and the student projects broken down into three broad themes explored or discovered in the studio. The projects and locations are varied. Jeanne Gang sites a Labor History Museum in Chicago's West Loop, Sumil Bald heads to São Paulo, Brazil for the World Social Forum, and Mark Tsurumaki asks students to envision a Park Lodge in Florida's Everglades. Political, social, and ecological issues are dealt with in the respective projects, and one can see the students taking these issues seriously in their projects. But like any book collecting student projects, the images come to the fore, and it is via the renderings and other drawings that readers can determine if the ideas tackling the issues are carried through in the designs. It is evident in these projects that addressing the program in traditional terms (room sizes, adjacencies, functions) is less important than exploring alternative design methodologies and site relationships, both trying to address the larger issues. Even though many of the designs illustrate unique approaches to dealing with site, more information on existing conditions could have been given for each studio. Capturing a sense of place for each project is difficult, except in more general terms, like Everglades or Chicago. As described in the book, site is less physical and local than historical, cultural, and global. Concomitantly, the projects can be seen as syntheses of local conditions and global concerns. What is also missing in the projects is a sense of exploration via physical means, be it sketches, concept models, or other means. I counted one hand sketch in the whole book with maybe twice that in model form. It's no surprise that computer renderings predominate (final, physical models are still found in abundance), but when designs are limited to the digital, one aspect missing are those early steps. A student can diagram their process, but these illustrations are labored and after the fact. This commentary is not nostalgia, it is a question about the changing process of architectural design: Are computerized/networked methodologies supplanting the common notion of design moving from the designer's mind to paper, model, or computer screen?